Following on from last months’ blog, it is time to shed some more light on those key questions to ask when thinking about internal van racking. Whilst everyone uses their van differently to others, there are some common questions which need to be answered to ensure you make the best use of the space available. What are the crucial items you need to store? This can be tools, products, stock or anything which you need to carry with you during the course of your business. The next step will be to work out the size of the largest item you need to store, if it is to be stored loose or is already boxed, and how you want to store it. Some customers prefer to have individual spaces for each item or type of item, whereas other prefer to have an open shelf capable of storing many items of various sizes. Either way, we would design the racking to store the largest item first. Which items will you need easy access to regularly? By understanding which items you need to use the most, we can help you decide whether it is better for them to be at a particular point in the racking unit. 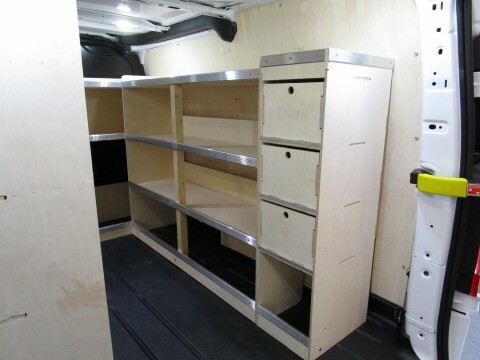 For example, it would be inconvenient to store your most used items further away from the doors, meaning you had to get into the van to obtain them. Which doors do you use the most, side or rear? 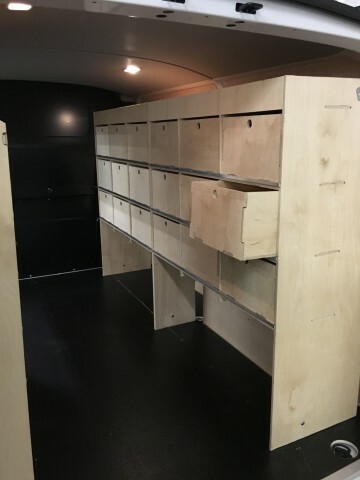 Similar to choosing the best point within the racking for your most used items, it is worth considering where in the van is the best position to place the racking units. If you often work in an environment where it is easier to access your side door than the rear, perhaps because of parking constraints etc., then consider whether it would be easier to place the unit containing those regularly used items opposite to the side loading door. Clearly, it may be the other way around and you may rarely use your side door, meaning you would prefer the units over the wheel arches at the rear. Either way, a few moments thought here could make life a lot easier for you. Occasionally we have installed racking units facing out of the side loading doors, usually this has been to store tool boxes or drill cases which need to be accessed regularly. Will you need to allow for carrying occasional items? Sometimes it may be necessary to carry occasional items, which will also need to be considered when designing or choosing internal racking. Whilst many trades now have products delivered direct to site, we sometimes have to allow for the odd sheet of plasterboard, bath, or boiler and such like to be carried. This will impact upon the available space left in the van after the racking has been installed. Consequently, it may be something we need to consider when designing the units, to ensure enough room is left for such an eventuality. Do you need to carry everything you currently have in your van, every day? If you are getting organised by adding internal racking, maybe now is the best time to have a clear out of old stock or tools that you rarely need? After all, carrying around extra gear will cost you space and fuel! Whenever we design internal racking, we always try and consider these questions to ensure we can help you to use your van to its full potential. 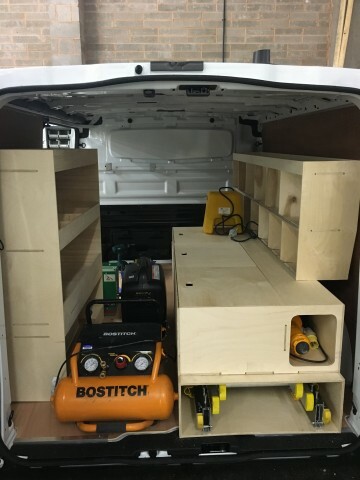 Many customers will know exactly how they want to use the van and how to store their gear, but a little time spent considering all of the possibilities can make a huge difference to the usefulness of your van, and can save you time and ultimately money. One final point we haven’t covered here, is the safety of storing tools and stock, so in the next edition we’ll look at some of the safety considerations.